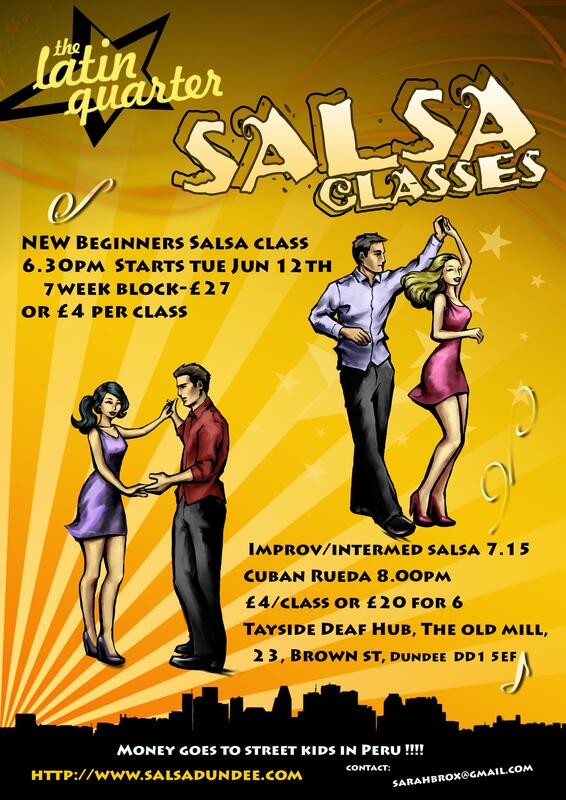 NEW Tuesdays Beginners cross body style salsa class (7 week block) starts Tue June 12th, 6.30-7.15pm at Tayside Deaf Hub, Old Mill, 23 Brown St, Dundee DD1 5EF. Come along spice up your life and learn the latin rhythms for summer ! 7 week block £27, or £4 per week. All money goes to Azul Wasi, a small home for 14 former street children in Peru. Can join first 2 weeks only. This will be the last set of new beginners classes until September. Please pass the word if you can. Email sarahbrox@gmail.com to register & reserve a space.